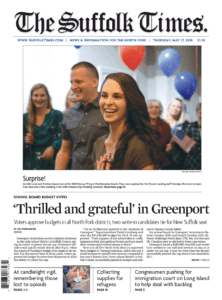 Happiness filled the room as a Jennifer Lenzi and Trenton Zanow entered Peconic Landing Monday afternoon, as staff held balloons and American flags to surprise the winners of the 2018 Veterans Day Wedding Giveback. Staff Sergeant Jennifer Lenzi, 23, and Air Force Technical Sergeant Trenton Zanow, 27, are both actively serving in the United States Air Force. The couple met at the 106th Rescue Wing in Westhampton Beach and now serve as members of the Connecticut Air National Guard 103rd Airlift Wing.